3 ingredients are all it takes to make your own dairy-free vegan chocolate at home. Add your favourite superfoods to this basic recipe for an extra nutrition boost! Make a double boiler: Fill a saucepan about 1/3 of the way with water. Bring it to a boil on the stove, then place a glass bowl over top. Ensure the bowl is slightly bigger in diameter so that the base doesn’t come in contact with the bottom of the saucepan, and so that no water gets inside when you’re making the chocolate. Once the water boils, reduce the heat to medium low. Chop the cacao butter into small pieces and melt it in the glass bowl, whisking occasionally. Again, be careful not to let any water inside. Once fully melted, whisk in the cacao powder and maple syrup. Using mitts or a towel to protect your hands from the heat, carefully pour the melted chocolate into molds. 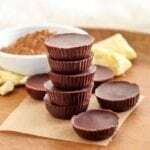 You can use candy molds, or simply place liners in muffin tins and pour the chocolate inside. Put the chocolate in the fridge to set for ~30 mins. Note that the amount of time needed for the chocolate to harden will depend on the depth of the molds you use. To boost nutritional value, try whisking other superfood powders like maca and lucuma into the melted chocolate before pouring it. About 1 teaspoon should be plenty. Decorate by sprinkling the tops with cacao nibs, goji berries, pumpkin seeds, or any other superfood you like. This works best if done when the chocolate has had about 4 minutes to partially harden in the fridge.